With the news out that the FSB basically told concerned G20 nations that cryptocurrencies are not going to destabilize their economies, we got the new reaction to a time cycle that is going to play out nicely. The key now is to find an entry area for Ethereum and Litecoin. 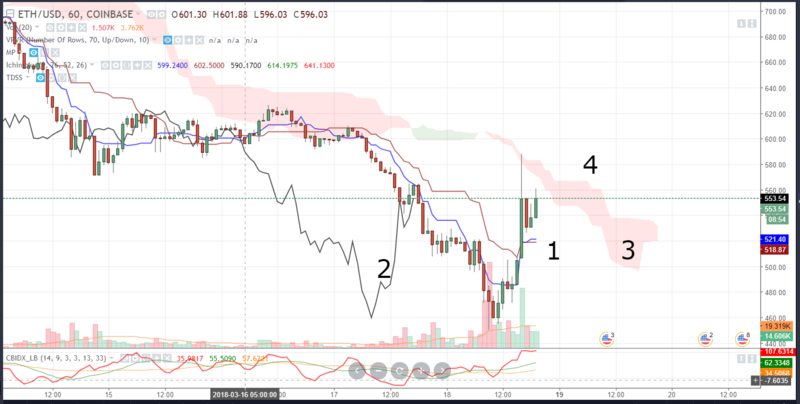 Similar to what I did on Friday for finding a Bitcoin entry, let’s review the Ethereum and Litecoin entries. The Conversion Line (Blue Line) must be greater than the Base Line (Red Line). 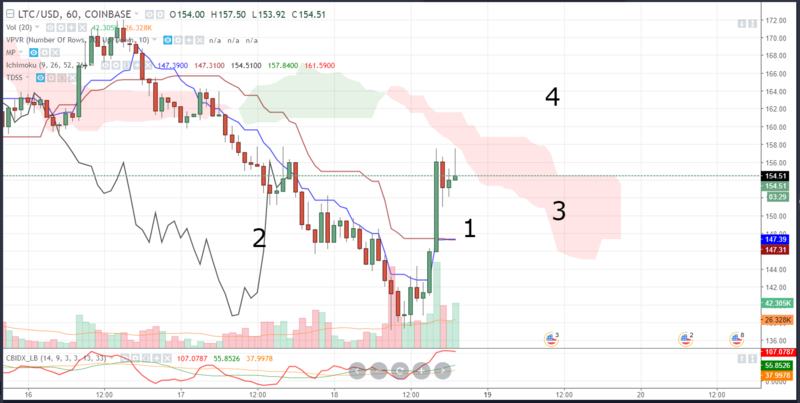 The cloud in front of price must be bullish (green mass). The Lagging Span (Black Line) must be above the cloud. 1. The Conversion Line (blue line) has just crossed above the Base Line (red line). This is a weak bullish signal, but an early warning sign that the trend may be changing into bullish conditions! Price is also currently below the cloud but is above both the Conversion and Base lines. 2. The Lagging Span (black line) has popped from the bottom and is now inside the candlesticks. 3. The cloud is still red, we need to see it turn green. We still don’t have conditions to go long. BUT, we do have some great early warning signs that we can get ready to enter on a long position based on this hourly chart. The area that we should be looking for will probably be in the 580-600 value area. 1. We should see a similar structure here compared to Ethereum. Price is below the cloud, but above the Conversion and Base lines. However, on this chart both the Conversion and Base lines are of equal value. This is a neutral signal, but still an early warning signal that the trend is changing. 2. Similar to the Ethereum chart, the Lagging Span is inside the candlesticks but has bounced off the lows. 3. We are waiting for the cloud to turn green (even just a little tint of green is enough to fulfill a buy entry). 4. An entry area may show itself around the 165 value area.